Written by Adam Calo on May 1, 2018 . 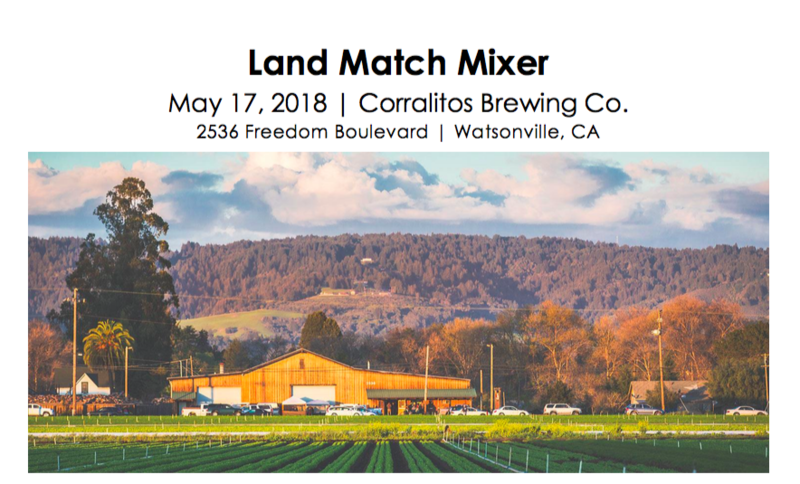 Join California FarmLink, ALBA, and UC Berkeley for a casual mixer at our local watering hole, Corralitos Brewing Co. Connect with farmers who are looking for land to start or expand their business; learn about the different challenges farmers face-- as well as the creative solutions and resources available to overcome some of these hurdles. There will also be a "web tools" station to guide those interested through Farmland Monitoring Project's FarmView application, as well as an area to register with FarmLink and learn about our upcoming website update and services it will provide. The most successful farmland matches are built on relationships between land seekers and farmers or landowners who are well prepared, informed, and supported. California FarmLink, ALBA, and the Farmland Monitoring Project are just a few of the resources available and eager to help. RSVP at http://LandMatchMixer.eventbrite.com and your first beer is on us! To learn more about this event or if you have any questions, please contact Mika Maekawa at mika@cafarmlink.org or call 831.425.0303 x7022.